Since we published our blog post on shingles there’s been a huge response to the photos of the amazing cliff house, Casa Acantilado in Salobrena, Spain, so we thought we’d share more about the project with you here, together with more photographs. The house was designed by GilBartolome Architects. The practice is known for their innovative use of both modern technology and traditional techniques to create amazing architectural forms. How Was the Casa Acantilado Roof Built? Architect Jaime Bartolome has published some photographs of the construction of the zinc roof structure on his blog. These first layers are a network of rebar woven over strip steel curves at intervals up the roof pitch, supported on acrow props. On first inspection they look almost like they might be timber and woven willow, the forms are so complex. This network of rebar was then cast into a single span, undulating reinforced concrete roof slab. The roof is finished with some fantastic zinc shingles made from elZinc® Natural, each with a turned-up corner to evoke a reptilian surface reminiscent of a horned viper. Here are some more images of that amazing roof (supplied by elZinc®). Click on the images to see a larger version. 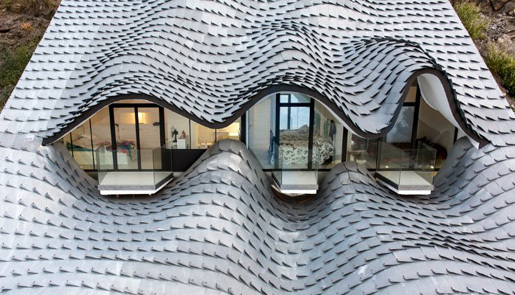 How could we build an undulating zinc shingle roof in the UK? In either case, he stressed, it would be important to ensure the roof build up was correctly detailed with an appropriate substrate for the conditions and to meet UK building regulations. “We’d love to be involved in such a project in the UK, and our partners elZinc® would be happy to repeat,” he said. More images of the project are available on GilBartolome Architects website here. Jaime Bartolome also published CGI images of the exterior and interior on his blog. If you come across any more information on this project, why not share it in the comments below? Interesting project. It would be also interesting to know how the drainage works. Shingles are just rain screen and the drainage is surface below? It seems that when the curvature changes the overlap occurs in the opposite direction of the rain water flow. thanks for your question – a very good one. I’m afraid the project architect would need to answer that one. (This is a product we supply in the UK).